The March for Our Lives was one of the single biggest days of protest in U.S. history. With hundreds of thousands in D.C., and tens of thousands in major cities across the country, there were a total of 800 protests around the country and internationally — it is clear: young people have ignited a fight back. In fact the New York Times reported that protests occurred in no less than 390 of the 435 Congressional districts in the U.S., indicating the massive breadth of this upsurge which has put the right wing and especially the National Rifle Association on the defensive. At the march in D.C., students and young people from across the country spoke about the public health crisis of gun violence in all its forms from mass shootings to gang violence to police killings of black people. These students are not content to limit this discussion to just gun violence, they have taken aim at racism, sexism, and corporate influence over politics. While the clear attempts from the Democratic Party to channel this movement into safe channels by placing emphasis on the 2018 midterm election have gained an echo with some, there are many students and young people who are not content to wait until November to see change. Below is an article from the new issue of our paper which gives Socialist Alternative’s take on this growing movement and what steps it needs to take to win real victories! This massive and historic movement is first and foremost a fight to end gun violence in schools. But it is also a major formative experience for a new generation who stands to inherit a world deeply mired in crisis. Although not yet old enough to vote, the students are already gaining valuable experience fighting back in massive numbers. Students are enraged by the political muscle of the National Rifle Association and its corporate billions – and are calling out politicians for taking NRA money. 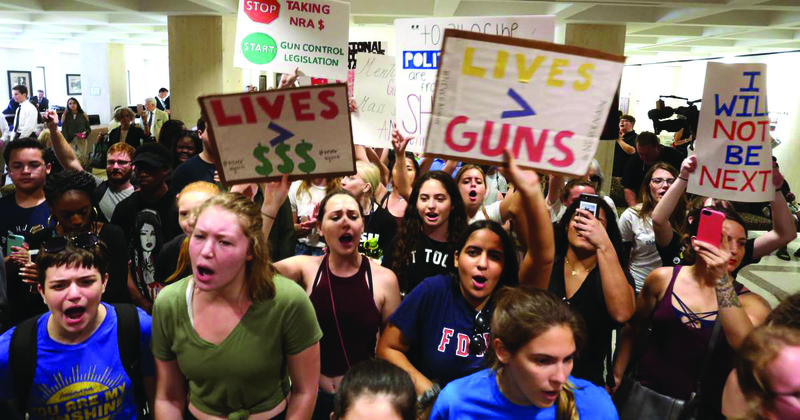 Against this, the key demands of the protests are for limited gun control measures, like banning the sale of assault rifles and expanding background checks but also for more funding for school counselors. It is widely understood that gun control measures on their own will not address the roots of the epidemic of violence. The proposal to arm school personnel has been widely rejected by students and teachers. A very important feature of both the March 14 walkouts and the March for Our Lives was the widespread solidarity demonstrated by young people across racial lines. Large numbers of black and brown youth from inner city areas participated. But they made clear that the issue they face is not so much mass shootings but the constant threat of violence including police violence. In this way, the movement is reigniting the struggle against racism begun by Black Lives Matter. The protests, which developed because of the the bold initiative of students in Parkland, Florida, have already dramatically transformed the debate on gun control in the U.S. The NRA is on the defensive in a way they have not been in a long time. The Republican-dominated government of Florida, nicknamed the “gunshine state” for its loose gun laws, was forced by the pressure of protest to approve new regulations on guns including raising the minimum purchase age to 21 and mandating a three-day waiting period on all firearms transactions. Unfortunately, the bill also contains some measures which would further militarize schools. Up until now – despite massive support for many basic gun control measures following a seemingly endless streak of horrific mass shootings – the Republicans and the NRA had successfully held off any meaningful reform. The game changer has proven to be the emergence a mass protest movement. Meanwhile, a wildcat strike of teachers in West Virginia also scored a major victory against a Republican led state government this month. Both these developments show that mass movements can win change in spite of a right-wing government. In a key midterm election year and given that the Republicans and Trump are so tied to the NRA, it is completely understandable why many people would link this movement to the need to vote the Republicans out in November. We sympathize with this. But we need to be clear that a key reason for why mass protest became necessary, and also widely supported, was because the Democrats have been unable to effect any serious change on gun control. This is connected to their utter failure to fight for the interests of working class people which opens the door to the right to use gun rights as a wedge issue. For the past year, the Democrats have refused to build mass resistance to Trump on health care, after his support for the fascists in Charlottesville, or on any other issue. They paid lip service to Dreamers, immigrant youth who have never known another country, but then abandoned them and dropped DACA from budget negotiations. The Democratic Party leadership wants to be associated with the student protests, but they also fear that a growing movement could start making bolder demands which would alienate their real base of support – big business. The movement would be wise to remain independent of the Democratic Party establishment’s influence and to stick to what has worked so far – mass action. The walkouts and protests planned for April 20, the anniversary of the Columbine shooting, are an opportunity to build even more momentum behind this movement, and if the Republicans still don’t cave, protests should be escalated during the elections. This movement should link up with the emerging women’s movement and with public sectors workers, especially teachers resisting attacks on their unions, to fight together against the whole agenda of the right and to drive Trump out. For many who participated in this protest, the demand for gun control is just a start. It’s clear that a large section of students see the problem of gun violence in the context of a broader social crisis in the U.S. Moreover, capitalism is a horrifically violent system and many students we met through the walkouts and the March for Our Lives were already describing themselves as socialists. Undoubtedly, these historic demonstrations are a product of deeper processes in U.S. society that are paving the way for even bigger struggles in the years ahead. With a world in desperate need of change, the so-called “mass shooting” generation is likely to become the mass movement generation. Tax the rich and big business to fully fund our schools – guns are not school supplies. Sawant Reelection Campaign A Referendum on Who Runs Seattle: The People or Amazon?